Park Rung Rueng. This recently renovated two bedroom, one bathroom town home is situated in a quiet older housing estate off Soi Khao Talo area of East Pattaya. Located only a few minutes from the Sukhumvit Road with convenient access to local markets, mini-marts, schools, and other local amenities. The home is well presented and features separate living and dining area, a fully fitted European kitchen with installed washing machine, two good sized air conditioned bedrooms and bathroom with hot water shower. It comes with private parking and small open air area to the front of the property to sit and enjoy the evening. The property is already equipped with Cable TV and internet connection. 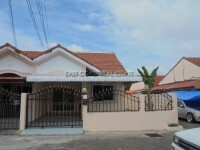 It is available for sale fully furnished with title deed held under Thai Company, so no expensive transfer cost.